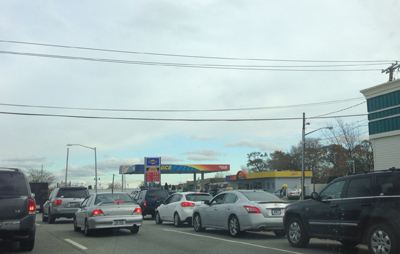 Long Islanders who have been facing a serious gas shortage following Hurricane Sandy can now expect some relief. Gov. Cuomo, speaking at a press conference in Manhattan this morning, announced that earlier today 8 million gallons of gasoline have been delivered to New York Harbor with another 28 million gallons scheduled to be delivered within the next two days. "You don't have to panic, we don't need the anxiety, we don't need the lines," Cuomo said during the press conference. In addition to the fuel supply, the U.S. Department of Defense has arranged for 5,000-gallon capacity fuel trucks will be on hand to offer drivers up to ten gallons of gas for free. 150,000 gallons of gas will be sent to resupply those tankers as Long Islanders and New York City residents deplete the emergency supplies. According to Cuomo, the tanks will be dispatched to key locations across the region. Vehicles will be able to pump directly from the trucks. Senator Charles Schumer, who also spoke about the gas crisis this morning, said that about 70 percent of the island’s gas stations are without power. Suffolk County has restricted the amount of gasoline residents can buy. Gas station operators have been advised to only allow customers to purchase up to 10 gallons of gas, and an additional 10 gallons for residents whose homes are still without power. The emergency gas, which is being delivered by the National Guard, will be available on Long Island at the Freeport Armory at 63 Babylon Turnpike. The other sites where free gas will be made available are the Queens Armory, 93-05 160th St. in Jamaica, the Bronx Armory, 10 W. 195th St., the Brooklyn Armory, 1579 Bedford Ave., and the Staten Island / Elizabeth Armory, 321 Manor Rd. he said. AAA New York has offered some helpful tips in conserving fuel during this time. Travelling at 60 mph during a 20-mile highway commute can save motorists 1.3 gallons per week. Accelerating gradually and anticipating stops reduces the amount of gas you car consumes. Check our Post-Hurricane Guide for valuable resources to help you recover from Sandy, and our Transportation Update to help you commute easier as the area recovers.